Assorted Notions: Ready, set, sew! My husband is out of town this weekend so I am turning off my phone and having a sewing marathon! I spent way too much time this evening picking out the cotton prints you see above. They are for a baby quilt for my soon-to-be-born neice. Orange, yellow, and brown... It seemed like a good idea when I was in the store (trying to avoid pink), but now I'm beginning to have doubts. Hm. I think it'll turn out okay, and besides, I'm thinking of this as the first in a series of quilts she'll get from me. Obviously not gonna all get done this weekend, but I like to have a goal in mind.. I almost had a sewing marathon this weekend. Work and vistors came into the picture. However I shall finish my boucle skirt tonight and hopefully start my jacket!! Sounds like a fun time!!!! Lucky you for the "free" weekend! 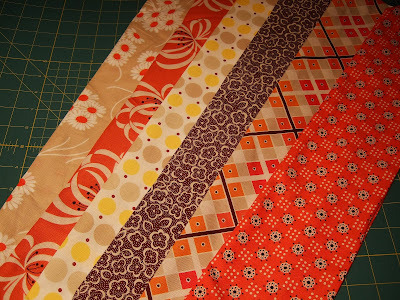 I like the quilt fabrics. Although I love pink, your new niece will receive plenty of pink and purple stuff. This one will be unique and as you said, it probably won't be the last gift from you! Can't wait to see your weekend results! I love the colors of your quilt, but if you can, slip a touch of green in there to ground those cheerful colors. This will "give the eyes a place to rest" and highlight the cheerful nature of the quilt. Have fun. Your last sentence reminds me of that line that Kit says in the movie, Pretty Woman. "You gotta have a goal!" Good luck with yours...I hope that you get more rather than less accomplished. Oh I'm jealous, I can't imagine having a whole weekend to sew with no interruptions. Have fun, I can't wait to see all you create! The link on my previous comment did not work, the quilt is in lacubanitacose.blogspot.com under the June posts. I LOVE the colors of the quilt! I can't wait to see how it looks once you start working on it! I need to have a sewing marathon as well. My boyfriend is out at a concert this evening, and I've just been procrastinating on the computer. Boo. Wow, the whole weekend. That's great. Make the most of it. I think the colors for your niece are brilliant. You can rest assured that she will have plenty of pink.